05 February 2015: Star Wars VII – a new hope? Is it a case of too little too late? When the original film came out in 1977, I remember reading George Lucas had planned nine sequential stories organised into three trilogies. 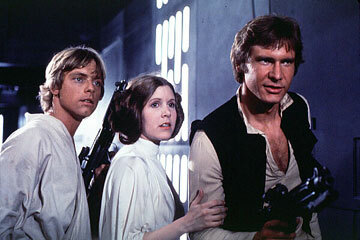 Star Wars, since retitled Star Wars IV: A New Hope, was the first story in the middle trilogy. When this trilogy ended with The Return of the Jedi in 1983, I hoped Lucas would roll on with the sequels, the third trilogy. I was never interested in the prequels. Who would want to sit through three films when the end result was already known? However, my love for Star Wars got me into the cinema to watch The Phantom Menace in 1999. What a mistake. A mistake repeated twice more with Attack of the Clones and Revenge of the Sith. I watched all three from a sense of loyalty to the original and with slowly diminishing hope that Lucas would pull something out of the hat. A good story, maybe. Now, decades later, the three films Lucas should have started in 1999 are on the drawing board. In fact, the first of the films, The Force Awakens, is out in December 2015. The fact that it’s to be directed by J. J. Abrams from a story by Abrams and Lawrence Kasdan (co-writer with Lucas of The Empire Strikes Back and The Return of the Jedi), suggests this film should have been called A New Hope. I admit to being curious to see what effect Abrams, who was only 11 in 1977, will have on the franchise. Will he rejuvenate it, as he did the Star Trek franchise with his eponymous 2009 film? However, for me there is a single big but. But it’s been 38 years since the first film. To put that gap in perspective, 38 years before the first Star Wars film saw the release of The Wizard of Oz. What if MGM had produced the same pattern of sequels as Lucas did with Star Wars? It would mean the seventh Oz film would have been released in 1977, the same year as original Star Wars. Indeed, if they did what Disney, the new owners of the Star Wars’ franchise, are planning to do, the ninth Oz film would have been released around 1981. L. Frank Baum wrote 14 Oz novels, which conceivably could have seen sequels rolling out until the 90s. In fact, with Gregory Maguire’s 1995 novel Wicked: The Life and Times of the Wicked Witch of the West, they even had a prequel of sorts. A prequel with a good story, what’s more. The sad truth is that ‘The Wizard of Oz’ was not a success at first, recording a loss for the studio. It wasn’t until it was rereleased in 1949 that the film went into the black. Since then, of course, it’s made a motza with repeats on television and sales of videos and DVDs. Still, I can’t help feeling that The Wizard of Oz I: Wicked, would have been a hell of a more fun than Star Wars I: The Phantom Menace. Here’s hoping 38 years is long enough for Star Wars to get through its self-reflective, rambunctious, acne-ridden teenage phase and mature into something really worth watching. 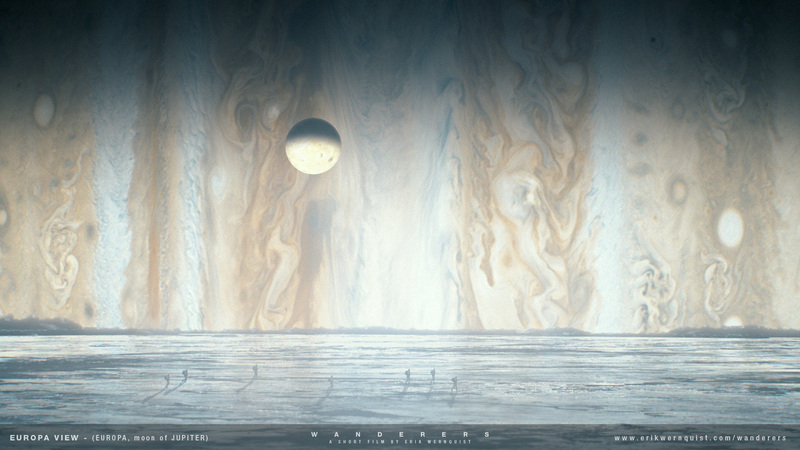 Jupiter seen from the icy surface of Europa in “Wanderers”. Go watch Wanderers, a short SF film by Swedish artist Erik Wernquist It will take up less than four minutes of your time. Copyright © 2014 by Warner Bros. Pictures and Paramount Pictures. All Rights Reserved. Without wanting to push the metaphor too hard, watching Christopher Nolan’s Interstellar is a bit like going on a first date. There are moments when you wonder if you haven’t made a terrible mistake in going to see the film, and other moments when you are seduced by startling visual beauty or revelatory lines of dialogue. And like many a first date, the whole is a much more fulfilling and enjoyable experience than its parts. In truth, I wasn’t expecting a lot. I was disappointed with the Dark Knight trilogy and was bored by Inception. 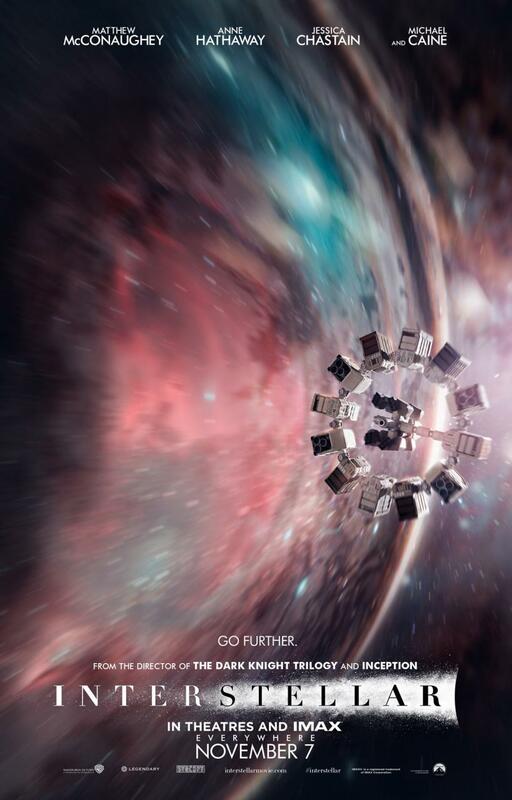 But Interstellar impressed me not just as a good film, but possibly a great science fiction film. It touches on two aspects of science fiction – a sense of wonder and a personal human connection with the universe – that contribute to my love of the genre. Some of the finest scenes in the film are those dealing with the implications of relativity on the passing of time; they carry a heavy emotional weight (and here I intentionally avoid the word ‘gravity’) that while entirely manipulative never succumb to melodrama. All credit to producer Lynda Obst and physicist Kip Thorne for the original scenario, and Jonathan and Christopher Nolan for the script. All credit to McConaughey, Hathaway and Caine for their performances, and a special credit for the acting of Mackenzie Foy, Jessica Chastain and Ellen Burstyn for portraying the three ages of Murphy Cooper. And finally, all credit to Christopher Nolan for delivering a huge movie with huge ideas without ever losing a very human perspective.